Soap is art! Are you surprised? Well, you should be, because few people know that such an ordinary thing as soap is a source of eternal creativity and satisfaction. In this video, we collected the best ideas with soap. Watch, enjoy, repeat! You can create a lot of awesome things, using the soap base. You can buy it in a craft shop. It becomes liquid after you melt it in a microwave. You can pour it into some shapes and add a little bit of food coloring. 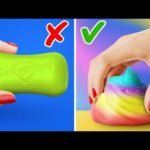 Magic color swirls in soap look amazing! You can make as many soap bars as you want. Leave them for yourself or give them to your friends. Anyone would be delighted to get such a cool handmade present. Another cool idea is making flowers out of…soap! You can make roses out of soap. Want to learn how to make them? It’s actually easier than it sounds. Watch this video and see how to make soap roses. You can put it into a ball of transparent soap so that it would last longer. Do you want to know how to make soap look even cooler? Put pieces of colored soap into liquid transparent soap an let it get hard. Then, cut these pieces in the way it is shown in the video and get magic soap crystals! If you pour some molten soap over loofa pieces, you’ll get a very useful thing – a soapy sponge. It is very comfy and it can be a great present too! If you have younger brothers or sisters who don’t like washing their hands, there’s a cool solution to this problem. You can put a little toy in a shape and pour some molten transparent soap over it. The trick is the following: the more often the soap is used, the sooner the kids would get the toy! Isn’t it the best motivation that can transform into a good habit? Tell us in the comments, which idea you liked most of all.